Former WWE Spanish commentator Hector del Mar has passed away at the age of 76 on April 8, 2019, due to a heart attack, as per Spanish outlet, Marca. del Mar was the voice of WWE in Spain and has been so for a very long time. 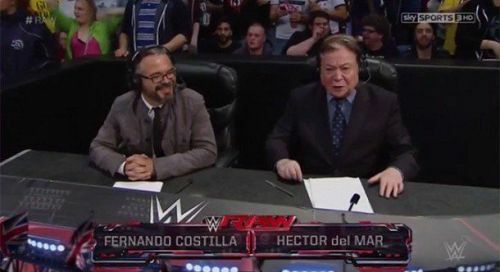 Del Mar, alongside Fernando Costilla, was the voice of WWE RAW and SmackDown for Marca TV in Spanish. The Argentine was born in 1942 and commentated football matches on radio and was known for his goal announcements, as per Solo Wrestling. Del Mar was known to be one of the best voices of pro wrestling in Spain and was the voice of WWE for Neox and Marca TV. Apart from commentating WWE, the veteran announcer also announced several football matches. He also wrote a book called Más Pressing Catch Que Nunca with his announcing partner, Fernando Costilla. Fans paid tribute to him on social media, with several asking for WWE to honor him with a place in the WWE Hall of Fame. Today one of most known spanish commentator has passed away. Spain is an important market for WWE and has a huge WWE following. WWE recently announced that Atresmedia would air WWE programming from April 6, 2019. SmackDown and RAW will air on WWE television on Saturday and Sunday every week. WWE had live events in Spain last year, with one in Madrid and another in Barcelona. WWE will most likely tour Spain once again later this year. We at Sportskeeda send our condolences to the family of Hector del Mar as well as the Spanish pro wrestling community.